As you launch your new ideas, seek financing and find initial customers, branding is often pushed to the side: deemed costly, time-consuming, and simply not a priority. While full branding and messaging do take time, a failure to understand and navigate the pitfalls of early-stage branding can stop your company from ever really taking off. Often, you think, “We’ll figure out the branding later—all I need is a landing page,” or “We’re in stealth mode, so I can’t publicly share what we really do,” or the truly dangerous “We can just use a template for now.” The problem with this thinking is that it prevents you from addressing the fundamental questions that define your brand and, more importantly, keeps you from communicating why your early adopters should trust you. A digital presence—even a seemingly simple landing page—that fails to address the foundational questions of branding and messaging can negatively impact early adopters’ trust. Branding and messaging require you to answer the tough discovery questions that prospective customers have about you and your idea. It is painstaking work to articulate and present your idea—to find the words, images, and positioning that will deliver you to the consideration stage of engagement. What is the impetus of your idea? Can you succinctly describe your products or services? What kind of organization or business model are you? Where you are in the marketplace, and where you would like to go? How do you currently market your products and services? Are there any trends or changes that are affecting your industry? Are there any potential barriers to success for your product or service? If you could communicate one single message about your company, what would it be? These early-stage brand discovery questions are vital to your digital presence and, in fact, the identity of your brand. Your answers shape the content and structure of your preliminary digital engagement plan. It does not matter whether you have a single landing page, a small site, a predominantly social approach, or just a sign-up form—it must reflect the answers to the discovery questions to some degree. Yes, it is true that your brand will change as you go to market—there is fluidity as you refine your messaging and learn more about what the customer wants and how the market will be impacted by your idea. Having a branding and messaging starting point will prevent you from taking the shortcut offered by templated landing pages that give you a cookie-cutter digital presence that makes you look just like everyone else. The “standard” landing pages can rob you of your uniqueness. Quick and easy templates are valuable in that they allow you to save money on designers and developers. Add a hero image (check), list the features and benefits (got it), incorporate clever team bios (yup) and a contact form (done). But these templates are being used by every other early-stage company and can trap you in an online experience does not distinguish you. More importantly, templates deployed without the branding and messaging can lead you down a path that fails to address the customer’s perspective. The Early-Stage Brand Discovery Questions help you examine your idea more closely—what is your idea, how does it fit in the market and where are you going with it? The answers to these questions are from your perspective. 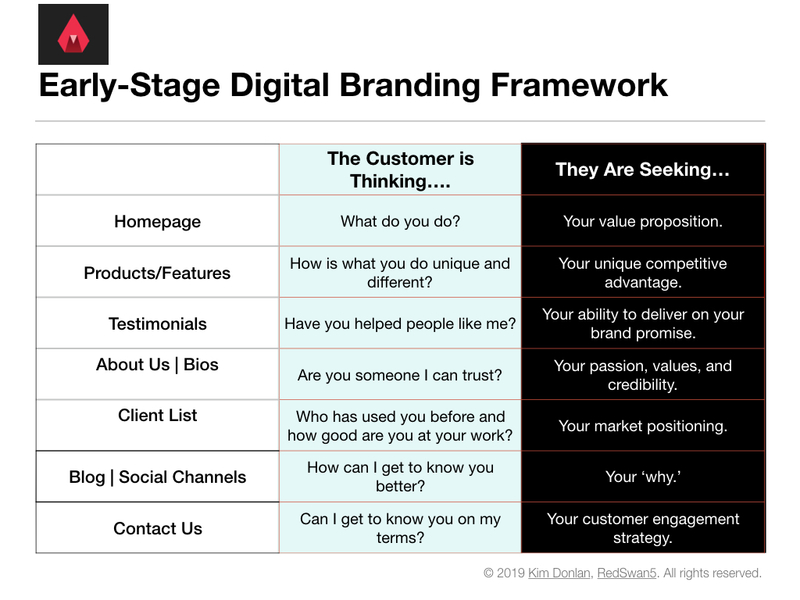 As you move towards the Early-Stage Digital Branding Framework, you need to think about how your answers can be framed from the customer’s perspective. Imagine you have a small site, just something that validates you and supports your efforts to close those initial pilots and secure funding. The branding and messaging are embedded in the typical sections (or panels) that you see on a website or landing page. Focus on the question’s being asked and not on the template format. Early-stage branding and messaging is hard work. What makes it much harder is the pressure to create a digital presence that supports your current goals and vision while still giving you room to evolve. Deep down, every startup needs to be validated by customers. Early-stage branding is your version of the Grey’s Anatomy scene where Dr. Meredith Grey says, “So pick me. Choose Me. Love Me.” And the Early-Stage Digital Branding Framework will ensure your idea connects with those who’ll love you most.